Hostel Urban Rio Cea i Leon, Spania: Bestill nå! The remainder of the amount due will be charged to your credit card 2 weeks prior to arrival. Should numbers or room selection change, the per person deposit times the number of people who actually travelled will be deducted from the total accommodation charge levvied by the hostel. The following group types are not accepted by this hostel: High / Secondary School, Stag/Hen/Bachelor Party If you have misrepresented the type of group you are booking for, your booking may be cancelled by the hostel." Merk av i boksen for å vise at du har lest og forstått vilkårene og betingelsene. Du må godta vilkårene og betingelsene før vi kan bekrefte bestillingen. Jeg bekrefter at jeg har lest og forstått ovenstående vilkår og betingelser for gruppebestillinger som oppgitt her på norsk. Bestill mer enn 7 dager i forveien for gratis avbestilling. 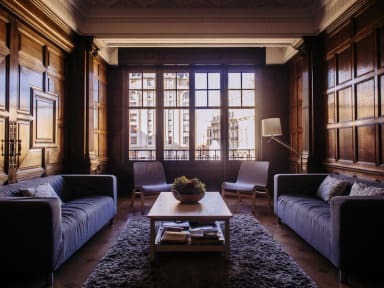 Hostel Urban Rí­o Cea is located in the heart of León, what there is to be seen is within walking distance, the Cathedral is a four-minute walk, likewise Real Basílica de San Isidoro, Barrio Húmedo & Tapas district. León is one of the major cities that the Camino Frances passes through on its way to Santiago de Compostela. 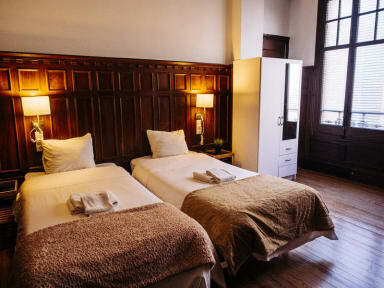 Urban Hostel Rio Cea has several double rooms with different configurations. The intimacy and privacy will be complete for visitors who opt for these rooms. Whether you choose a room with three single beds or prefer a room with a double bed and a single bed, the triple room is perfect for those guests seeking more space without sacrificing the convenience of apartment in central León. Whether you are traveling alone and want to share a room as if you need four beds available for a group of friends or your family, quadruple rooms are definitely the best option to share the charm and friendly service at Hostel Urban River Cea. A practical and convenient solution that ensures the best rest. If you want to complete your stay at the Urban Hostel Rio Cea placer enjoying the kitchen....Ahead! We offer a fully equipped kitchen with appliances and all types of utensils (crockery, cutlery, glassware, etc.) so that you use the kitchen anytime. Furthermore, the large dining table kitchen breakfast (check availability and rates) is served daily. Ah! And if you want to wash your clothes, we have washing machine and dryer (check availability and prices). Check in from 16:00 to 20:00 . Check out before 12:00 . Payment upon arrival by cash, credit cards, debit cards. This property may pre-authrize your credit card before arrival. The use of washing-machine and dryer are € 4 if your stay is less than three days in other case are free to use.